In recent years Ireland v France has become the must have ticket for drama and this season's game had it all - and more. An incredibly tight game that went down to the final play played between two teams rebuliding after the World Cup, in front of a packed, loud and superbly good natured crowd (reportedly 2,100 it looked far more and streched the small ground to the limit). Add to that a floodlight failure that gave us an extended halftime break which, if anything, made the evening even more memorable with at least one former Irish international coming close to making her singing debut as the radio commentary team desperately tried to expand a 10 minute halftime summary into something nearer an hour. The action on the field lived up to expectations. Scores were few, but this was a full-blooded affair that it was impossible to turn away from for a second. And it was ultimately decided by a moment of anticpatory genius by one of the most exciting new prospects on the field, which was appropriate even if the home crowd left disappointed. However French No.8 Safi N'Diaye was always dangerous, and France had several chances to get the scoreboard moving, including two penalties from Jessy Tremoulière that failed to go close thanks mainly due to an annoying swirling wind, though one bizarrely nearly lead to a try as it drifted wide but fell almost perfectly for the French forwards. 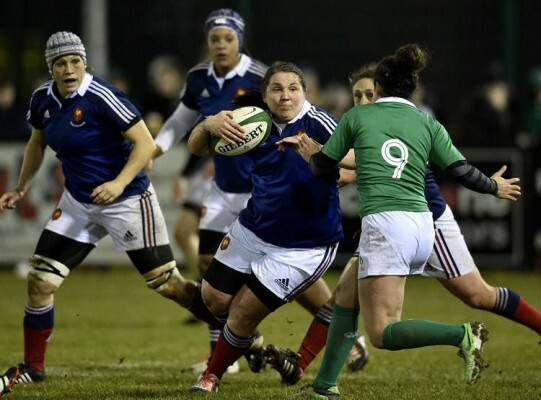 When Ireland finally broke out, after a difficult Niamh Briggs down-field kick was fluffed by the otherwise excellent Tremoulière, they look far more dangerous and in the end it was probably France who were the happier to hear the halftime whistle. After two abortive attempts to restart the game, due to the floodlight problems, it was Ireland who continued to pressure and shortly after the resumption Ailis Egan barged over at the back of a maul to put the hosts 5-0 in front. However Ireland had lost some of their advantage up front, first after an injury to Laëtitia Grand, which brought on Pauline Rayssac who was now to outjumping O’Reilly, and also the replacement of Julie Duval by Christelle Chobet at prop - the more experienced Chobet having a great game, involved in everything. Nonetheless Ireland continued to press, dominating possession, but then came the moment of speed of thought and awareness as Perpignan’s young star, Caroline Boujard, playing only her first season of elite rugby, who read an Irish pass perfectly to seize on an interception. One juggle and she was away to touchdown just to the right of the posts. With the wind now in her favour Tremoulière had no problems and France were ahead, against the run of play, 7-5. A few minutes later Tremoulière added late penalty to open up a lead which meant that Ireland would need more than Briggs’ legendary boot to turn things round. In a pulsating final few minutes, that went on for some considerable time beyond the 40 minutes shown on the stadium clock, Ireland were camped inside the French 5m line. Several times they seemed to have huge potential overlaps as the French desperately threw bodies in to defend the line, but the ball either seemed to move the wrong way or the final extra pass just wasn’t taken. As a result a by now ragged French defence somehow held on to seal an impressive – and vital - win.